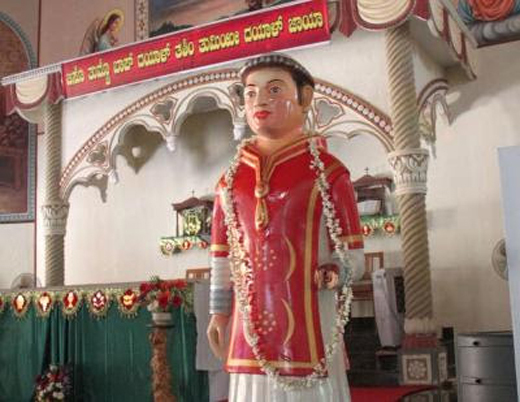 Udupi, July 16, 2016: The wooden statue St Lawrence reported found at Sita River and placed at Sasthan Church is now installed at St Lawrence Shrine, Baselica. The 40-kg statue was installed, with a religious ceremony at three century old shrine devoted after same saint, which has been declared a Minor Basilica. Interestingly, along with it, the statue of Fr Roque Zeferino Noronha too was found on July 5. A fisherman Vasudeva Kharvi found the statue floating at sea and brought it ashore. Five feet high St Lawrence with one hand broken, was found near Hangakatte. The statue painted recently has been kept at Sastan Church. During the blessing of statue, Rev John Walter Mendonca, parish priest of Sasthan said the finding of the statue is a total mystery. "Me and my parishioners felt it should be treated with care and be placed with respect. We could have kept it with us, but all of us decided that this basilica dedicated to St Lawrence is the apt place that could be accorded to it. Hence we are offering this statue as a gesture of our love." Rev George D’Souza, parish priest of the Basilica said that the statue was brought in a procession where hundreds of parishioners of Sasthan took part. "It will be kept at the main altar of Church till August 1, where celebrations will mark declaring shrine as a Minor Basilica and will be shifted later on. Considering it as second miraculous statue to be installed at the shrine,’’ Rev George said that an appropriate place will be found. The first miraculous statue installation of St Lawrence at Attur Parish and Shrine has a rich history with its origin tracing back to 1759. Though the statue was floating but seems to be very bright with good features. A beautiful statue. St Anthony Bless all.